The ad showed the apartment under construction, but it looked and sounded interesting. I like living in open, and well-lit places. Much less depressing. We went to look at the apartment after contacting the number on the Craigslist ad. The place had enormous potential. It was the great-room off the back of a large colonial on a triple-sized suburban lot. They had dropped a wall down the middle to separate off a couple of bedrooms. The bedrooms were smallish but open to the ceiling with skylights in each one. The rest of the place was all doors and windows. Very bright. We were told what was still to be done, and that it would be done before January 1st. After looking at another apartment, and calling on a few other ads, we decided to rent the place. They still needed to paint, finish the kitchen, bring in appliances, add outlets for the refrigerator and counter-top appliances, lay carpet, put doors and hanger-bars in the closets, fix the lights (they were still wired for one room) and close up the large entryway into the main house. Progress seemed slow, but we had time, and liked the place so much we were being patient. The landlord told us that he had built the house, but owned several houses around the country and was planning on spending at least the winter in Atlanta, maybe longer. He also mentioned that he was considering renting out the rest of the house, but was running out of time to find a tenant before he had to go. He told us he was a music composer and producer, and that along with buying, selling, and renting property was how he made his money. He said his wife was in Atlanta, and getting impatient for him to join her. There was also a young man (early twenties) who was always around. He was introduced as his son, and even signed the lease along with the landlord. We were given the son's bank account information to direct-transfer the rent to him. The lease was one of these internet documents. Very unofficial looking. We signed the lease which mentioned that we were allowed to have our cats, and to park on the lawn next to the driveway. He said that he would have pavement laid down in the spring where we were to park. We gave the man $2900 and started getting ready to move. It became apparent the last week of December that he wasn't going to be ready on time. We started to move our things in anyway. I was ready to pull the plug on the whole deal, but had been feeling a bit under the weather, and on an emergency visit to the Gastroenterologist, was told that there was a very good chance that I had a large mass in my lower intestines (thank god it was a false alarm). We didn't need the extra aggravation so I told him the place had to be livable at least by January 1st or we would have to deduct rent for each day we couldn't live there. He got everything in just under the wire. By everything, we mean the ABSOLUTE minimum he had to do. Now the issues started. The carpet had been laid down with no padding or backing directly on concrete. The kitchen floor was just laid on top of everything, and not joined to the carpet, or glued. The fridge was dirty and smelly. There were no outlets on the side of the kitchen where the fridge had to go, leaving me to use an appliance extension cord at first. The lights were still wired for one room, so that if you turned on the main living room lights, the bedroom lights also came on. The wall between the house and the apartment had been sloppily closed up, and leaked sound and light. The cabinets had no shelves. There were nails sticking up out of the base cabinets under and around the sink. There was garbage in the drawers in the bathroom. Everything was filthy from construction dust. There were hanger-bars in the closets, but with NO center supports. They wouldn't hold more than a couple dozen hangers without snapping. The closets themselves were not deep enough to accommodate the width of a standard clothes hanger. The shower flooded the bathroom the first time it was used, because there wasn't any sealer around the sliding doors, and there was no outside light at the entryway. This was all that was immediately apparent. We found more issues as we went on. Some of the issues were addressed. He attached the kitchen floor to the carpet edge, but it was still loose and wavy. The lights were fixed by removing the bulbs in the bedrooms and telling me to just use table or desk lamps. He installed a quadruple outlet on the refrigerator-side of the kitchen, but ran the wire along the baseboard and around the pantry doors (more on this later). One cabinet shelf was found. The wall was better taped and spackled but not finished (in the spring, we were told). We were given an outside light (after a couple of weeks of him troubleshooting it). He hung ugly metal straps (like you would use to hang a large pipe) to secure the closet bars from the ceilings. We suggested that the multi-hanger things might help with the clothes in the closets because they swiveled, so he told us to deduct $50 from February's rent to pay for them. I sealed the tub with silicone myself, rather than wait for him, and everything was cleaned and vacuumed by us also. Not perfect, but it was still a bright and cheerful place. We figured we would ride-out the lease and if he refused to make it any better, we would leave at that point. The rest of the house was rented to a VERY LARGE Spanish-speaking family. This happened at the last minute the last week of December while we were starting to move things in. They had several very young children that seemed to ALWAYS be screaming. The thin, cheap wall between the house and our place suddenly showed how cheap it was, as we could hear these poor kids day and night. I was told that the last minute rental happened because the landlord wasn't sure about the tenants, so had a background check run on them. It had come back OK he told me, so they were moving in. We later found out that the family were illegal aliens. I doubt he ran a background check on them. Now things get really odd. We ran out of heat 3 times. There seemed to be an issue with the heating oil people wanting C.O.D. only. This was not comforting. The pipes froze one day. I had to stay home and babysit them to make sure there were no leaks when they thawed out. There was a door next to the range where the utility closet was. I dropped something under the door one day, and attempted to slide the stove out to open the door. I discovered that the floor around the stove had been pieced together from scraps of vinyl, and held together with clear packing tape. I then decided to take the door off the hinges to preserve the floor, and found that the stove had been wired into the same 220 line as the water heater by splicing it directly in with wire nuts. Wow. Another day, after noticing an odd smell, I pulled the fridge out from the wall to find what you see here. 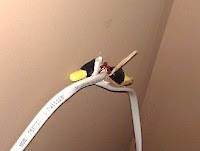 He had connected two scraps of electrical wire together behind the fridge when he wired up our outlet. This, mind you, was an outlet used for a large refrigerator, coffee maker, and toaster. Can you say fire hazard? The outside light stopped working, and went 6 weeks before being replaced. The smell I was looking for by the way, turned out to be emanating from the INTERNAL vent for the toilet. There was a vent stack in a partitioned-off corner but no hole through the ceiling or roof to the outside. I can't even begin to tell you about the things that were not unsafe, but just wrong. Things like the moldings and how they were attached, or the doors that were hung wrong, the walls that looked like they were about to fall down, and the lack of outlets. 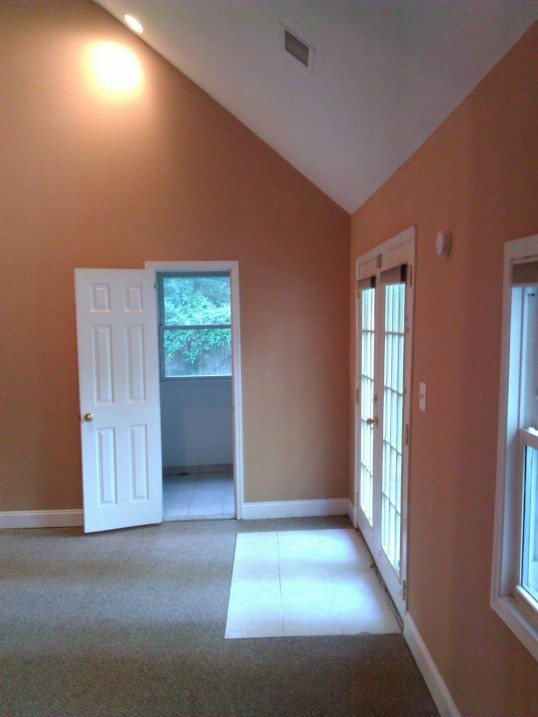 The paint was cheap and chalk-like, and badly needing another coat or two in many places. Then, the mysteries about the house started. The landlord was oddly anonymous at times. A lot of mail was coming to the house for many different names, and from many scary places. Courts, lawyers, banks. It was starting to look more scam-like every day. A quick bit of research showed that he DIDN'T OWN THE HOUSE! He was not listed anywhere as the owner. Our lease stated he was the owner and didn't disclose him as a manager, business partner, etc, or name anyone else as the owner. Can you say fraud? We also could not find ANY connection between him and the owner (a 30-something local woman). To make matters worse, the house was in pre-foreclosure, and the taxes were unpaid. As we started to dig deeper, a letter came addressed to "occupants" from a court appointed referee lawyer informing us that the house was to be auctioned off on August 2nd. We gave a copy of the letter to the people renting the house (which was when we found out they were illegals). We told them that he had fraudulently rented them the place and needed to worry about being evicted at some point. The wife gave us a card from a police officer that had come by looking for the landlord at some point, and also told us that several times people had knocked on the door looking for the woman that was listed as the owner, telling them that the house was about to be foreclosed on. Gee, thanks for the heads-up. We also found out at this time that the landlord had told the people in the house that he was a doctor, and that he and the homeowner were married. There were stories about him being verbally abusive to the wife. They also told me that when he was complaining about the electric bill being so high, he had told them it was our fault, because of all of the computers and gadgets we had (all off during the day). I called the officer, and found out that he was investigating a case where someone had rented the house before the people that were in there now. A man from the Boston area had sent a sizable deposit for the place, only to be told that it was no loner available. The landlord had kept the deposit, and rented to the illegal family instead. The first renter got the police involved to get his money back. The officer told me that the landlord seemed to have a business-relationship with the homeowner of some kind and was renting the place out and pocketing the money. He said that it seemed that "this is what he does". Nothing highly illegal, he said, but definitely a low-life scummy sort of guy. He advised us to stop paying the rent and get out before things got strange. He said that there was nothing he could do at the moment, but if the landlord threatened us, or messed with our property to give him a call. We had already decided to not send the rent to landlord, but hold it pending some legal analysis. He told us that he really DID own the house, and would come by with paperwork to prove it. He also said that the owner was his wife (no records of this anywhere) and that she was dead (also no records). The day to see the papers kept getting pushed back, and finally we were told that they had too much personal information on them, and he would rather send them to our lawyer if we had one. In the mean time, he HAD shown up to show the family in the house the papers. He ran through them quickly, telling them that it meant he owned the house now, and when they asked to make a copy, he insisted that they couldn't because their copier had the wrong size paper. He left to go to Staples, supposedly to make copies. He never returned (suprise! ), but called to get their lawyer's phone number to fax them to. Their lawyer got a phone call from him saying that he would need a couple more days to get the papers in order. We got help from an old friend of mine with the legal side of things. My friend agreed to accept the proof from the landlord, and advise us with the legality of the lease, and our termination of it. I got a call as I was getting on the train to go home one night from the landlord. I did not answer. The voicemail he left asked for us to call him so we could "resolve this matter". I text-messaged him back stating that I was on the train, and was not going to discuss a personal-legal matter in a public place. If he had any paperwork to send or anything else to say to contact our legal representative, and I gave him his contact info. In the meantime, he actually DID send the paperwork to the other tenants lawyer (an immigration lawyer who they knew). She called me and said that the paperwork was legitimate, but questionable, and seemed like a ploy to stall the foreclosure. Our lawyer received nothing. He advised we look for a place (already in progress) and draft a letter of termination. He said the lease was null and void on several accounts, so that we could legally break it. We were advised to draft the letter without using the words 'apartment', 'rent', or 'lease'. We drafted the letter, he made some minor corrections, and sent it registered, return-receipt mail, not expecting to get any confirmation. We had found a new place (200 feet away!) and started to move out. The house was taken by the bank at auction (I was at the auction) as the minimum bid was $660,000. As of this date, it is still listed as owned by the mysterious woman, and the taxes are still unpaid. The landlord listed our apartment for rent in Craigslist again, for $400 more a month than we were paying. He lived in the apartment for a couple of weeks, and then disappeared. We got a call once from him asking us to not touch the mailbox (he saw me checking for mail) advising that this was mail fraud (it isn't). The ad is gone, and the apartment still vacant. The people in the house are still there. They told me that he put a lock on the air conditioning thermostat, and set it on 79 degrees, complaining about the electric bill again. We actually got the return receipt back as delivered. That was a surprise. The forwarding address WAS in Georgia too. When we checked the address out it was to....wait for it... ANOTHER bank-owned house! As of writing this, there has been no further contact. We think we've heard the last of this, at least in regards to the pseudo lease. We would like nothing more than to read about the landlord in the paper though, or watch him hiding his face from news cameras. The family of illegals is still there. We realize now that he rented to them because they can't take him to court. This is why he told the first potential tenant the apartment was no longer available. In the end, the thing that bothers us the most is this: We think this guy considers himself some sort of financial genius. He had a whole entourage of people with him. We want the chance to see him go down in flames and tell him to his face what he REALLY is. A damned low-life parasite. We are happily living in the new place. And, yes. We checked out the new landlord. He really owns the house, and it is an official, town-inspected apartment, with the taxes up-to-date.